Over the past 6 months I have turned into an Audible nut. I’m addicted. I listen to audio books day, noon and night. I love them because it’s an easy (lazy) way to digest information whilst I’m rushing around on the underground or being stuck in traffic on the M25 for hours. My most recent audio encounter was with a book by marketing guru Seth Godin. You may have heard of Seth. He’s not your usual university professor or straight-laced marketing guy. He’s a bald, quirky genius who really understands how to create products that stand out, that people will buy and he also knows how to make products that yield success. His delivery is engaging and he’s a very enthusiastic guy. Anyhow, the book was called The Purple Cow. 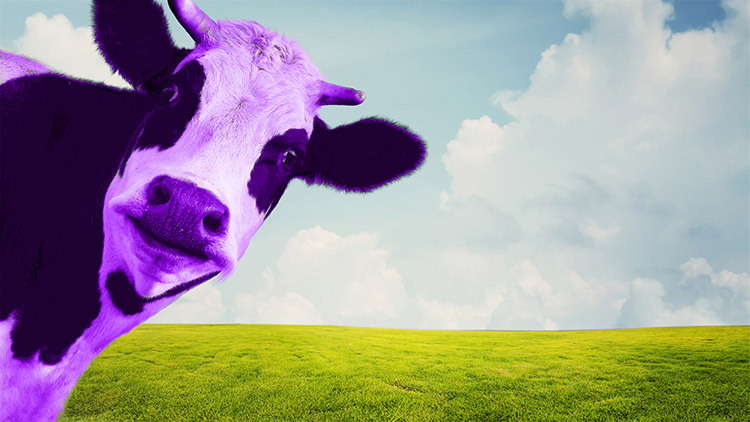 In Seth’s world, a Purple Cow is a product that is uniquely positioned against anything else on the market. I’m not talking about new inventions necessarily but a product that has been designed to offer something different. A product that offers true ‘emotive value’ to a customer. A product that make them feel good. A product that is ‘remarkable’. Seth explains that, back in the 60s, 70s and 80s (Mad Men days), companies made middle-of-the-road products and then invested millions in advertising to sell them to the masses. Well, those days are gone. People want more. They want a product that demonstrates exceptional design, is unique and that makes them feel happy or satisfied by their purchase. Mass advertising is dead! So, what is a Purple Cow exactly? A Purple cow is a product or service that has been designed form the ground up. The money that was previously spent on advertising is now being spent on R&D, design and production. If you want a product to be a true success then you have to create something that is remarkable. The design needs to be thought provoking and the quality or delivery exceptional. People will no longer buy cheap, poorly produced products. Selling regulations and the viral nature of the internet will destroy any company that tries to do so. Right, I understand what a Purple Cow is but how can I compete with huge companies? Seth explains that larger companies don’t really get the Purple Cow idea. Well, they may get it but they are not in a position to do anything about it. They don’t take risks due to the size of the business. They have stakeholders and often shareholders to appease so taking risks is a dangerous game and could be damaging if it’s a flop. Of course, this opens up the door for start-ups and smaller players who are agile enough to go for it and to take a risk. This is why we have seen the emergence of so many tech companies and clever product designs arrive on the Kickstarter scene in the last couple of years. So, how I turn my online business into a Purple Cow? Rule number one is to not copy your competitors. Study them by all means and see what they are doing but do something different. Don’t produce what they’ve produced because any success will be short-lived. The key is to understand your customers. Speak to them and find out what they want. I’m not talking mass-market questionnaires; I’m talking phone calls and real personal conversations. Your customers are the best people to tell you what they would buy and what features they want. The design process should not be rushed. You need to make sure your product or services tick the right boxes and that it has the emotional engagement with your customers. Take the Apple iPhone, for example. I know Apple is the largest company in the world but they didn’t get there overnight and they didn’t get there by offering a poorly designed product. Apple’s success is down to really understanding their customers. In the early days of the iPhone, they didn’t copy the likes of Nokia, Motorola or Sony Ericsson. They re-invented the mobile phone and turned it into a mobile computer because people needed more than just a phone. The design was unique with the smooth curves, chrome finish, elegant touch screen and, of course, those apps!!! Apple also focus’s its efforts on the product experience. They don’t advertise their phone in a technical way where they list the camera megapixels, processing power and battery life. They show their customers what can be achieved by using the phone. They show you the fantastic moments the happy memories and the services that can be accessed by the phone. That is what truly engages people emotionally! I read an article a little while ago about how they also have a team of people who measure the ‘out of the box’ experience. They work on creating a truly fun and enjoyable experience which puts a smile on people’s faces. Those extra little touches such as white cables and neatly designed packaging make people really appreciate why they have spent more on this particular product. It gives them a sense of value. This is why people come back for more and queue up outside Apple stores for hours or even days. What if I have a service? How can that become a Purple Cow? A service can create a unique experience just the same as a physical product. Think about your service delivery. What do customers want from your service and how can you make it the best and slickest service possible? What are your competitors not delivering? The smallest touches like ‘thank you’ gifts, specials advice or even a personal phone call can really make you stand out from the rest and build a closer relationship with your customers. Big companies don’t do this! If your customers feel like they are getting a great experience then they will come back to you and probably recommend you to their friends. Word of mouth promotion is way more powerful and lasts far longer than mass advertising. OK, so now that you understand the basis of a Purple Cow I thought I would put it into some sort of context. 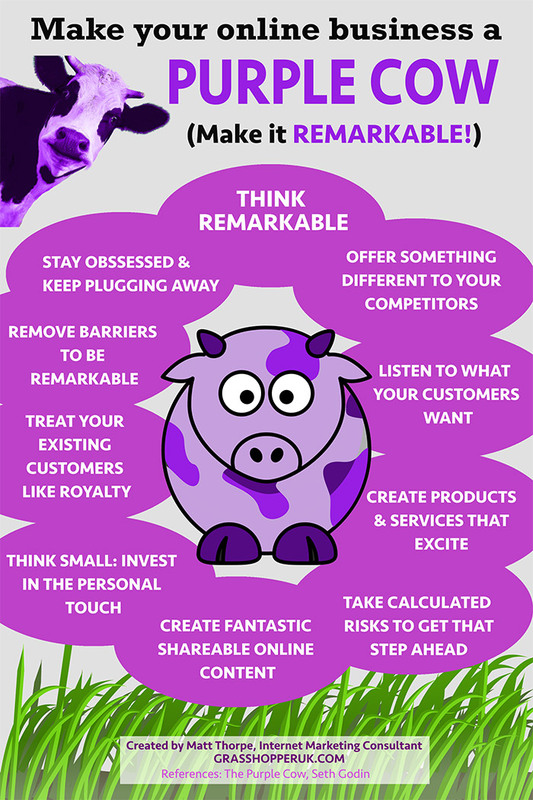 Below is a free downloadable infographic showing you how to turn your online business into the ultimate Purple Cow. This will help you how to make your business ‘remarkable’! Think about how to make your online business different to the rest. What would make your visitors think, ‘wow, these guys are good or yes’, ‘I love this product’. Be different to stand out from the crowd. Take a look at other online businesses that sell your products. Do what they are not doing. Make your business unique and exciting. Don’t copy them! Ask your customers what they want. Contact them directly on a personal level and ask for their feedback. You will be surprised what they say and they will appreciate being listened to. Products that are very good are bad. If they don’t really excite then they will fade into the distance. Make products or design services that deliver true value and demonstrate uniqueness. Playing it safe is no longer good enough. Taking calculated risks is the only way to stand out from the crowd. Be bold and be committed. Give them products and services that go beyond everyone else. People won’t buy every time they visit your site so give them an experience. Invest in creating a truly amazing experience where can engage with you and get value from their visit (i.e how to guides, tips, advice, etc). They will then spread the word. Your customers don’t want a faceless company to take their money and forget about them. They want a personal experience. They want to feel loved! Test your products with them and let some of them test your products for free. They will spread the word. Look after your existing customers and treat them like friends. Keep talking to them and show them you appreciate them. They will feel special and show you loyalty in return. If there is any reason stopping you from being remarkable then find a way around it. If a supplier can’t do what you ask then find another one. If people are negative towards your ideas then ignore them. Surround yourself with people who share your ‘remarkable’ vision and who can help you achieve it. Keep re-investing in your products and services. Keep your brand fresh, your content engaging and keep communicating with your customers on a personal level. Your perseverance will pay off. How can I recover from the Google Mobilegeddon update?